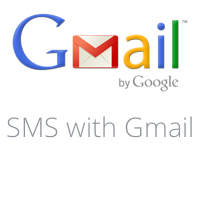 In today tutorial i will going tell about the new SMS services started by Google.you can easily send SMS to any one in the world to any mobile which is supported mobile operators for SMS Chat in Gmail.It is very easy to send a SMS using it you just need to enter the number and type your message and hit enter. 1. )Initially, you’re granted a credit of fifty messages. 2. )Every time you send a message, your credit decreases by one. 3. )Every time you receive an SMS message in Chat (for example when a phone user replies to one of your messages) your credit increases by five, up to a maximum of 50. You can seen the list of mobile operators which is supported for SMS chat. In India following operators are are supported. 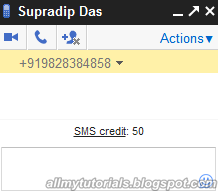 So in today tutorial i will show you how to send a SMS in gmail. 1. )Go to chat box in gmail then hover your mouse to the contact to whom you want to send a sms.Then click on more and then click on send sms (See image below). 2. )Then enter the mobile number in the location box and click on save. 3. )Now just type your messages and hit enter your sms will send to your friend if his mobile number is in the supported operator list. So it is all easy to do that ,hope you all like what Google doing these days.Feel free to ask anything if you have any query or suggestion please leave comment in the comment box and don’t forget to subscribe to blog.